This site for dugwell #PW127 located in the village Singidanga, in Gaighata block of North 24 Parganas district was cancelled. The site was donated by Niranjan Das. The reason for cancellation is that there are two arsenic safe water sources closeby and those who requested for a bore dugwell is wealthy enough to construct one such source himself. The new site is in the village called Sabaipur in Gaighata and the land is donated by Bijoy Das. Gave the hand over package. 2ft water. 500ml theoline was given. 15 families 66 peoples, drinking and cooking used. 11 ft water. 15 families, 66 people. Used for drinking and cooking. There is 15 ft of water. 500 ml theoline was given.15 families. 66 people. Good water used for drinking and cooking. has been dane of pw127. 15 FAMILY, 66 PEOPLE, GOOD WATER. 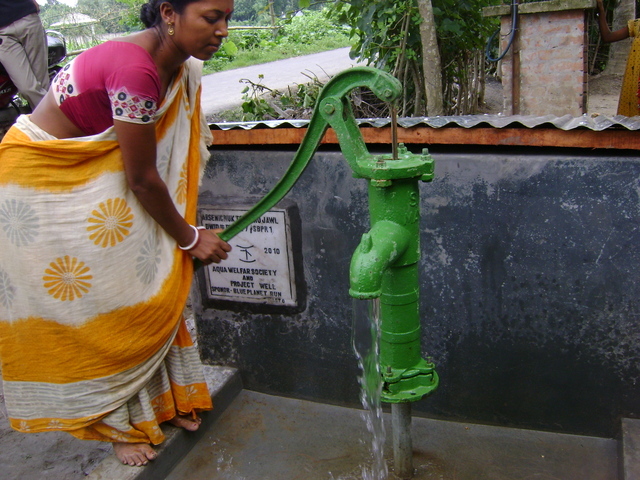 Construction of a bore-dugwell is complete. Waiting for pictures. The arsenic test and application of the disinfectant are scheduled. The community will be trained to apply the disinfectant and field workers will visit the bore-dugwell for two years or until the user community feels confident to take the responsibility of the bore-dugwell. According to the register record of July 2011 the total consumers=66; Families=15; Male=33, Female=33, children <5 = 4 and students =29. Now 15 families are using this source. Male=26, Female=25 and Children=15.